You guessed it...the schedule has been updated! (since Monday!). Please please review this. We are still trying to get everything sorted and that means there are changes happening. And...this one got updated too ;) Check it out. Not too many changes but make sure you have the right dates! Please confirm your student teaching position below! We are also still looking for student teachers! If your dancer is interested - please let us know. We will connect you with a class. We will be arranging a mandatory meeting for student teachers to learn about the expectations and roles within their classroom. This meeting will be led by Miss Christa and Miss Kris. More details to come soon. Please let us know if you would like to help with one of the above classes! Don't forget that because PBT is on a term by term basis! This means that the classes don't run every week. Please make sure your dancer is aware of these dates! They will be posted on the board in the lobby as well. Dances that started rehearsals in the summer will be charged on Monday September 24th. Please review the document below. This indicates the dances you will be charged for. If you have any questions, please let us know. The LOL/Cool Kids Booster is rotating! The dates that the Booster is scheduled are below. Let us know if you have any questions. We are very excited about our competition line up this year. 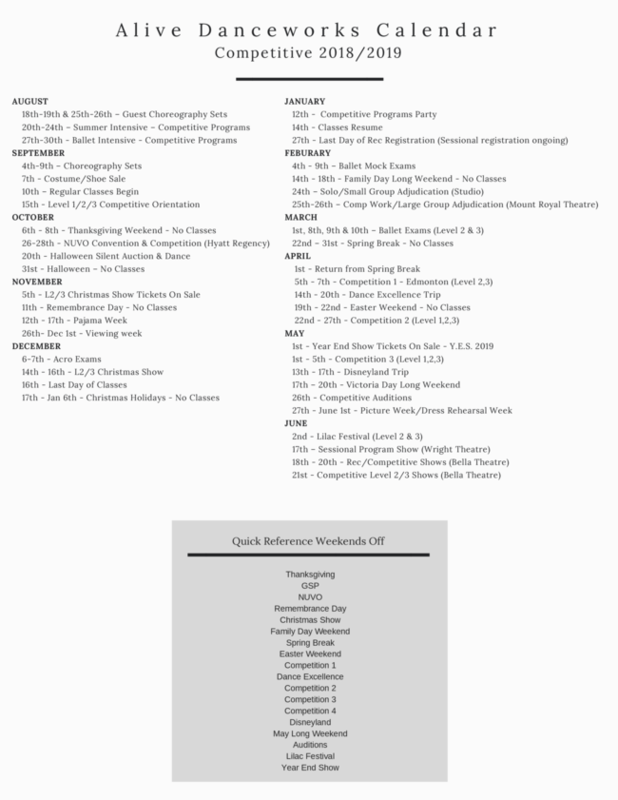 As you know, we are involved in travel this Spring season and had to work around the dates within as well as consider the many factors that make our competition season wonderful. Our competitions were selected based on date (no conflict with travel as well as not taking up Spring Break days as I do try very hard to protect these dates for your family plans), venue, length of competition, location, opportunity, level, business structure, reviews, community conversations and more. This process is not taken lightly and much thought and consideration went into selecting. Note: We release these dates early on in the year so that dancers and parent can notify schools and teachers of their absences and plan way in advance for the potential missed school time. Don't forget that October 5th is a regular class day at Alive! This is not a holiday. Please review our calendar below and enter these dates into your schedule! Miss Victoria wanted us to pass this event onto our level 2 dancers as she thinks this is something that might interest our dancers! This show comes highly recommend by her!